Hotel Sand Bay, Sevastopol. 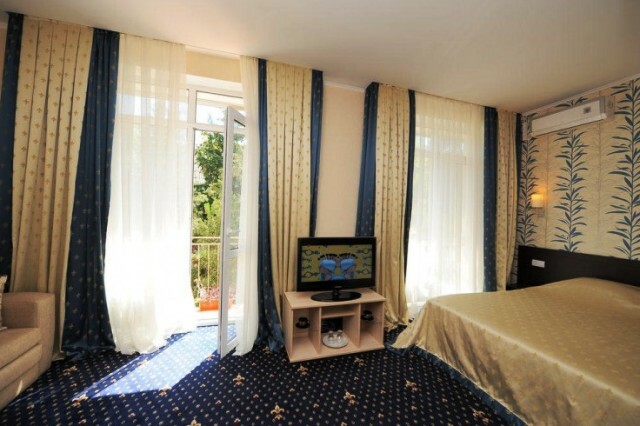 Hotels in Crimea. Book a room at Sand Bay complex, Sand Cove. Park Hotel Sand Bay is a unique hotel in Sevastopol, with its own endemic park and landscaped beach on the shore of the bay of the same name next to the National Reserve "Chersonese" in the neighborhood Streletskaya Sevastopol, situated on a closed area of 4 hectares. 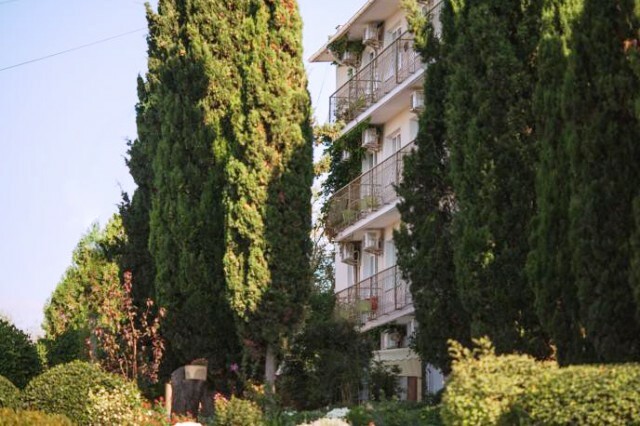 The complex is located immediately on the coastline in one of the most panoramic places of the city. 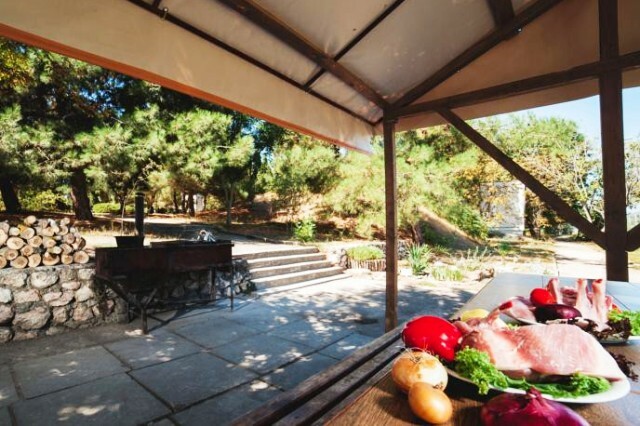 Sand Bay is 300 meters from the nature reserve "Chersonese" and 5 km from the historic city center. 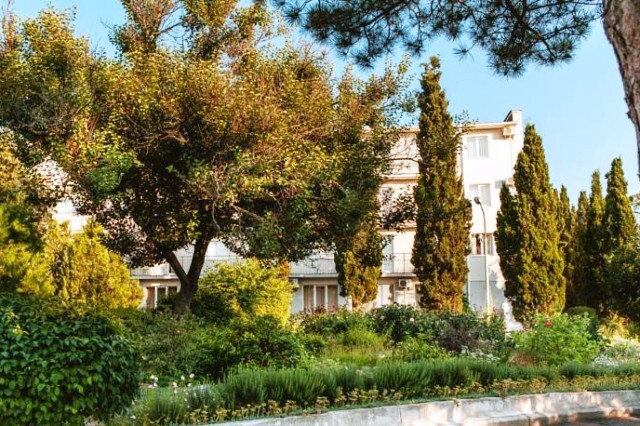 The hotel provides guests with the opportunity to live near the sea, enjoying a unique microclimate which is formed by a combination of the sea air, a high degree of ionization and the sweet smells of conifers, which is recommended in the treatment of diseases of the upper respiratory tract and overall health. The park with rare plants inhabit wild turtledove, squirrels, weasels and hedgehogs. 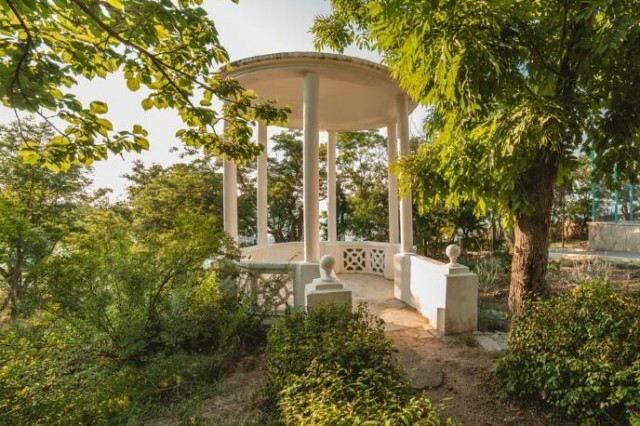 Equipped with gazebo, rotunda, walking paths and benches. 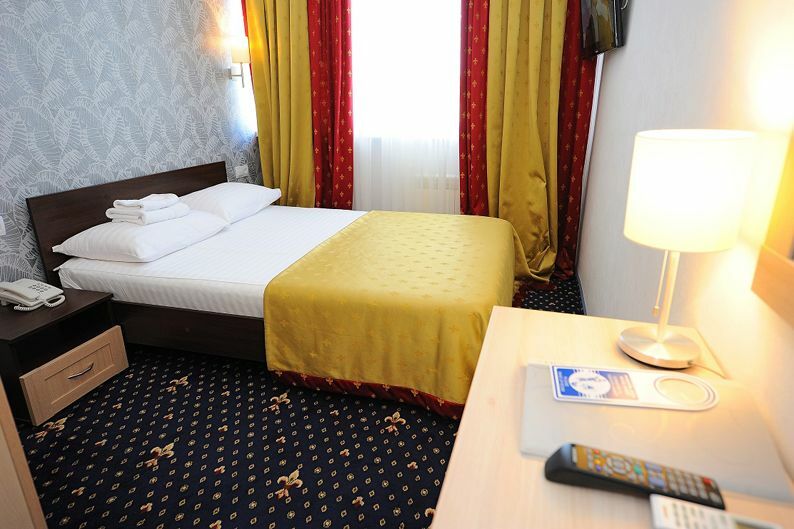 The hotel's accommodation is offered in two buildings at the level of business and standard. 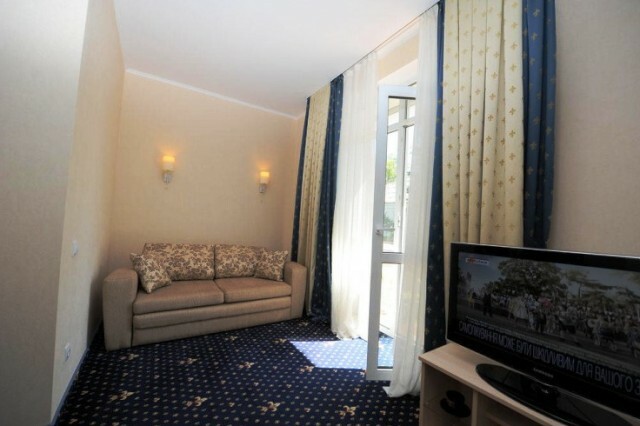 All rooms are modern and comfortable with excellent views of the Black Sea and the park. It offers free high speed WiFi, furnished playground, pavlinary, grill area, two cafes, one of which you can admire the sunsets. 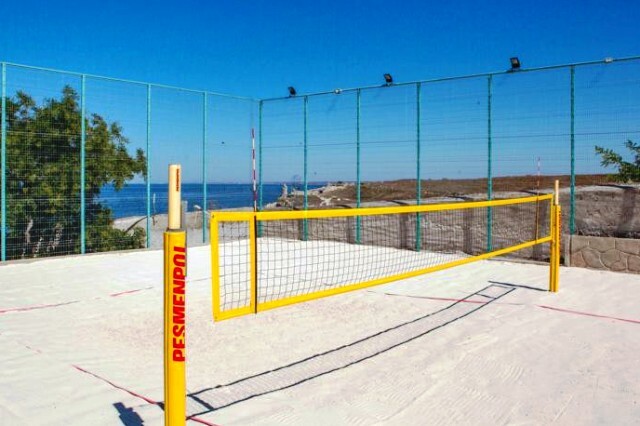 There are two professionally equipped beach volleyball fields with special white sand. The total length of coastline is 150 m pebble beach where are provided deck chairs, changing cabins, showers and fresh shady canopies. Skilled chefs at the two café serve European and Russian cuisine. Main cafe "Antey" is open all year round. Species "Triton" on the beach, open during the summer season. It provides various types of food: breakfast, half board or full board. In the number of rooms and public areas include free WiFi. 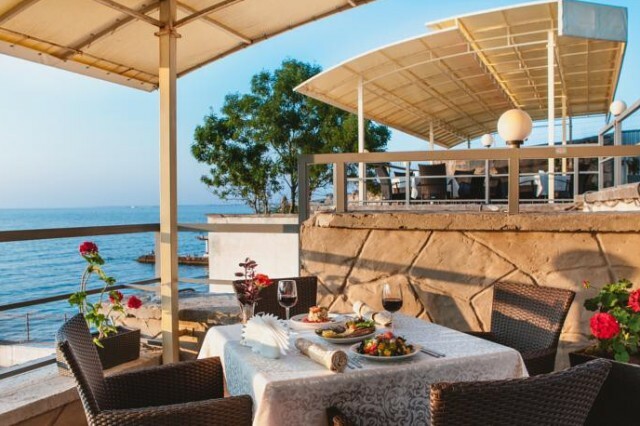 Hotel Sand Bay, is an example of the Crimean hospitality and the perfect combination of quality services for business and comfortable family holiday at the Black Sea. For guests traveling by private cars provided a paid, secure and free parking. 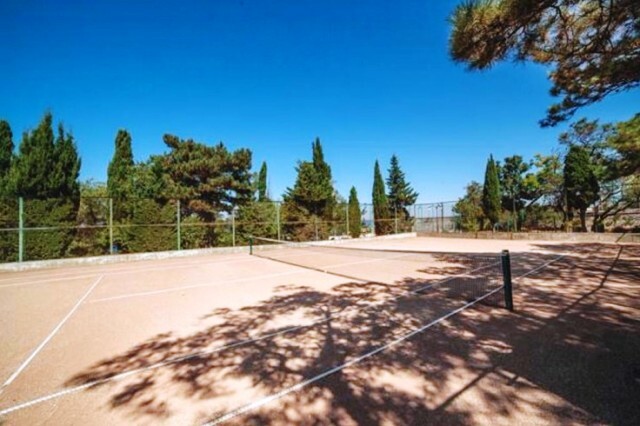 Included in the price: continental breakfast, use of sports facilities, park infrastructure, equipped beach (including beach chairs, beach towels), bottled water. If displayed, double that number, it means that it is designed for 2 people. In this case, if there is a need for settling a greater number of guests (children and / or adults), these guests will be accommodated on an extra bed (couch and / or cot). Maximum number of places provided for these rooms is reflected in the summary. In some rooms there is a possibility of arranging a larger number of guests than specified in the description. Such information is necessary to clarify further. Housing "Antey" Park-hotel and boarding house "Sand Bay"
The main part of the hotel "Sand Bay" - ​​"Antey" is located right by the entrance to the complex, 150 meters from the beach. Four-storey building, without lift, is equipped with a video surveillance system, a heating system and operates all year round. There is a twenty-four hours reception all at the Park Hotel and boarding house, "Antey" cafe, souvenir shop, safe deposit boxes, conference hall with 50 seats. In this building represented 49 rooms of different categories and levels of comfort. Six of them on the first floor, without balconies. The design is in the same light beige style. The best view of the sea opens from the 4th and 3rd floor, on the north side. The southern part of the housing facing the park and Sevastopol. Housing Poseidon Park Hotel and boarding house "Sand Bay"
"Poseidon" - two-storey building of business class for the discerning guest! Located 50 meters from the sea. 16 modern and comfortable rooms equipped with electronic locks. Some offer a magnificent view of the bay and the sea shore! 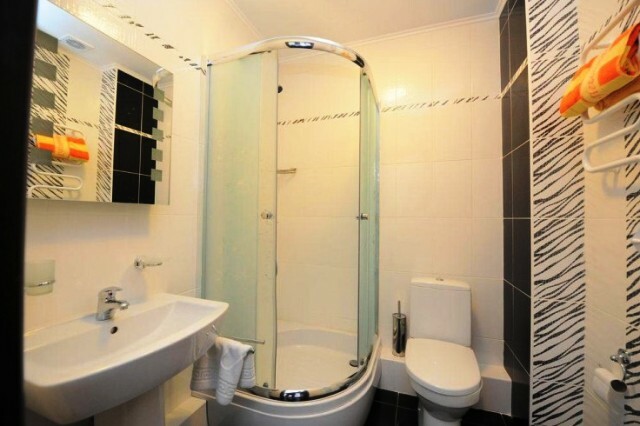 Suite Double, Junior Suite Double, Standard Double / Twin have a equipped bathroom. The Superior QRPL - tub and shower. The Standard Single have showers. The first floor is without balconies. For the decoration used high quality materials and textiles. Equipped with a video surveillance system and electronic locks. Conforms to European four stars. Replacement of towels daily. The house "Antey" is at 150 meter distance. from 3 to 14 years - 30% discount when staying in a room with accompanying adults. Breakfast - 240 rubles; Lunch - 390 rubles; Dinner - 330 rubles. Optional breakfast in the cafe "Triton" - 330 rubles. Price per room per night from 24 Euro. 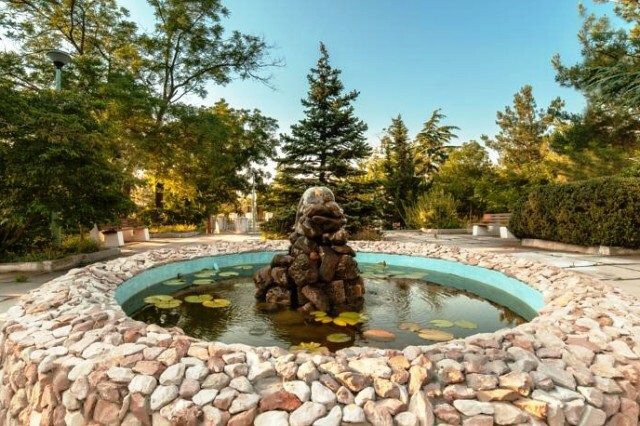 Kozak Travel "Sand Bay" - a unique park-hotel and a guest house, located 50 meters from the sea in an environmentally perfect place Sevastopol, right on the beautiful bay, a large park area. 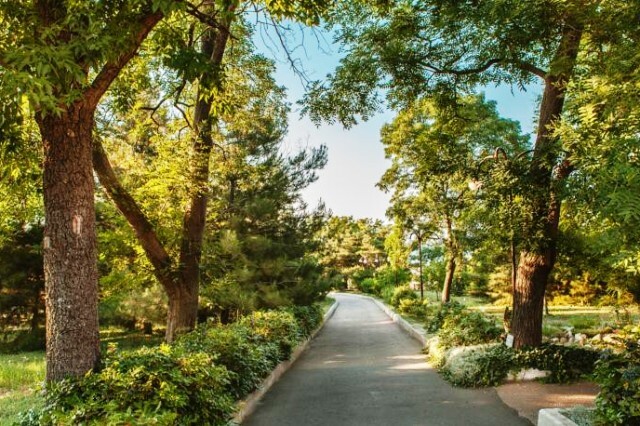 Local unique microclimate, which is formed by a combination of sea air ions with volatile production of coniferous trees in the park, is indicated for the treatment of diseases of the upper respiratory tract and overall health. 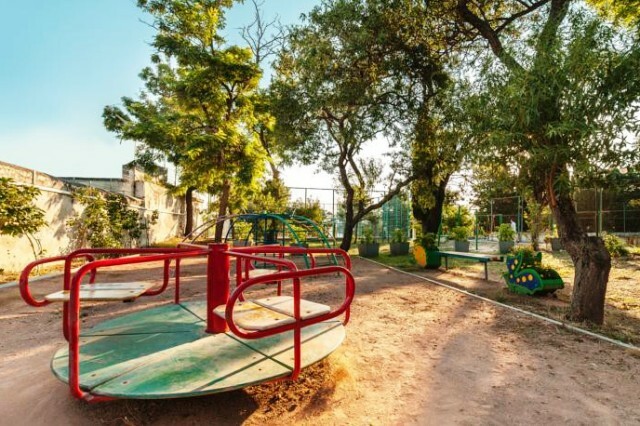 Given all these conditions, "Sand Cove" is recommended for relaxation and recreation for families with children, for quiet measured rest, as well as for business communication, combined with relaxation Park Hotel and boarding house "Sand Bay" with its own endemic park and landscaped beach on the shore of the bay of the same name next to the National Reserve "Chersonese" in the neighborhood Streletskaya Sevastopol. Distance from the town's bus station is about 7 km from the international airport of Simferopol - 100 km. The park with rare plants inhabit wild turtledove, squirrels, weasels and hedgehogs. Equipped with gazebo, rotunda, benches and walking paths leading to the beach. 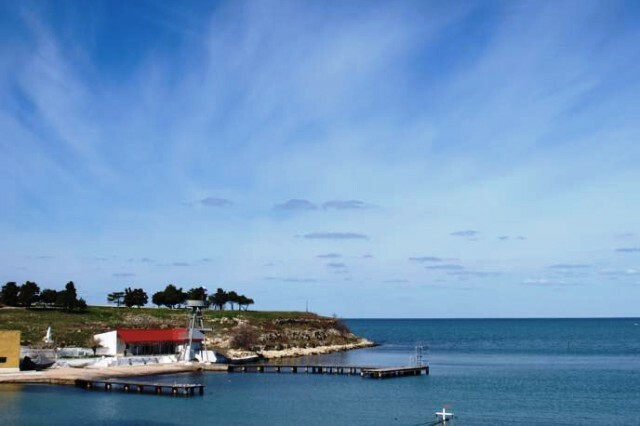 The private beach area at the Park Hotel is a significant advantage, because in Sevastopol are not many hotels have their own beaches Residential complex "Sand Bay" consists of two buildings: "Antey" - 150 meters from the sea and "Poseidon" - luxury housing in the 50 meters from the sea. Both buildings have independent heating, room hot and cold water, wi-fi, cable TV and work all year round. All rooms are decorated in a classic style and are equipped with refrigerator, air conditioning, flat-screen TV. Bathrooms come with a hairdryer. The rooms "Poseidon" housing also has bathrobes, slippers, umbrellas, safe and tea sets. Some rooms have a panoramic view on the sandy bay The on-site mud baths. It offers individual cosmetic treatments (massage, anti-aging mask) and complex treatment of diseases of the skin, musculoskeletal system, male reproductive organs, central nervous system, peripheral nervous system, gynecological diseases. Procedures occasion based on the unique therapeutic mud of Saki Lake. Guests on site: two cafes, a barbecue area with a gazebo, two professional beach volleyball, darts, badminton, boccia, mini-zoo with peacocks and pheasants For the youngest guests a children's playground on the beach and in the park, a special children's area bathing beach, a children's menu in the cafe. Some rooms can accommodate a cot free Guests of the Park Hotel provides free wi-fi. 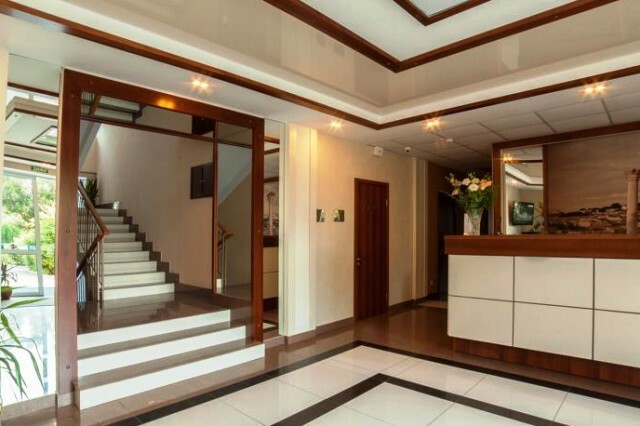 For business travelers and groups, the hotel has a fully equipped conference room and a set of business services (fax, copier, printer, scanning and printing of documents). You can also receive and hold conferences, seminars, sports and themed events. The Territory has a secured parking. From the hotel the nearest public transport station, market and shops provides a free shuttle (shuttle). 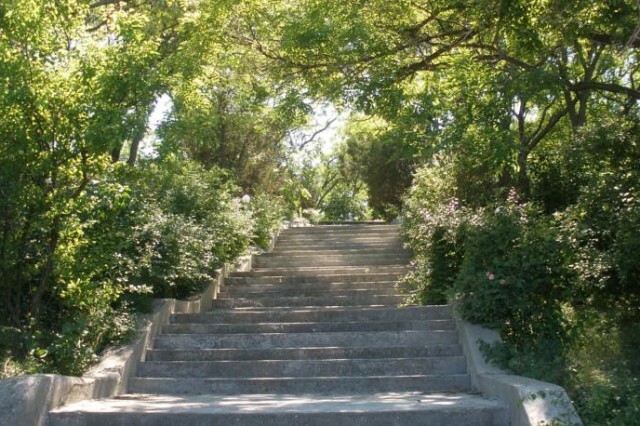 Possible car rental ANNOUNCEMENT "Sand Bay" - a unique park-hotel and a guest house, located 50 meters from the sea in an environmentally perfect place Sevastopol, right on the beautiful bay, a large park area. 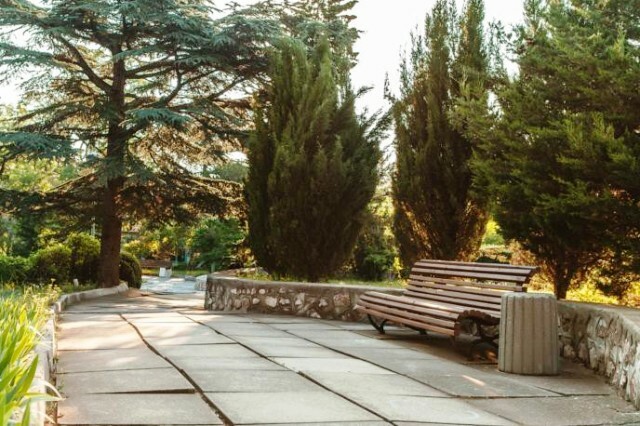 Local unique microclimate, which is formed by a combination of sea air ions with volatile production of coniferous trees in the park, is indicated for the treatment of diseases of the upper respiratory tract and overall health. Given all these conditions, "Sand Cove" is recommended for relaxation and recreation for families with children, for quiet measured rest, as well as for business communication, combined with relaxation ADVANTAGES Rconstructed the number of rooms Own equipped beach and park with rare plant species Mini Zoo: pavlinariy At 300 meters from the Park Hotel - reserve "Chersonese" The protected area DESCRIPTION OF THE COMPLEX Park Hotel and boarding house "Sand Bay" with its own endemic park and landscaped beach on the shore of the bay of the same name next to the National Reserve "Chersonese" in the neighborhood Streletskaya Sevastopol. Distance from the town's bus station is about 7 km from the international airport of Simferopol - 100 km. The park with rare plants inhabit wild turtledove, squirrels, weasels and hedgehogs. Equipped with gazebo, rotunda, benches and walking paths leading to the beach. 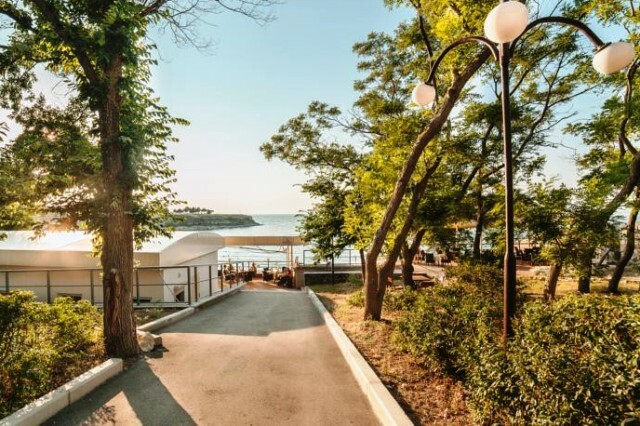 The private beach area at the Park Hotel is a significant advantage, because in Sevastopol are not many hotels have their own beaches Residential complex "Sand Bay" consists of two buildings: "Antey" - 150 meters from the sea and "Poseidon" - luxury housing in the 50 meters from the sea. Both buildings have independent heating, room hot and cold water, wi-fi, cable TV and work all year round. All rooms are decorated in a classic style and are equipped with refrigerator, air conditioning, flat-screen TV. Bathrooms come with a hairdryer. The rooms "Poseidon" housing also has bathrobes, slippers, umbrellas, safe and tea sets. Some rooms have a panoramic view on the sandy bay The on-site mud baths. It offers individual cosmetic treatments (massage, anti-aging mask) and complex treatment of diseases of the skin, musculoskeletal system, male reproductive organs, central nervous system, peripheral nervous system, gynecological diseases. Procedures occasion based on the unique therapeutic mud of Saki Lake. Guests on site: two cafes, a barbecue area with a gazebo, two professional beach volleyball, darts, badminton, boccia, mini-zoo with peacocks and pheasants For the youngest guests a children's playground on the beach and in the park, a special children's area bathing beach, a children's menu in the cafe. Some rooms can accommodate a cot free Guests of the Park Hotel provides free wi-fi. For business travelers and groups, the hotel has a fully equipped conference room and a set of business services (fax, copier, printer, scanning and printing of documents). You can also receive and hold conferences, seminars, sports and themed events. The Territory has a secured parking. From the hotel the nearest public transport station, market and shops provides a free shuttle (shuttle). Possible car rental FOOD Breakfast. Continental. At extra charge. Complex. Payment and order on the spot: Lunch - 390 rubles, dinner - 330 rubles.. INFRASTRUCTURE parking	Free outdoor guarded car restaurants and bars	zone BBQ Cafe "Antey": traditional Russian and European cuisine and the Beach "Triton" café with live music and a zone of free wi-fi Summer cafe Tour agency	SERVICES Order	taxi transfers colors and gifts excursions Internet: high-speed WI-FI throughout the park-hotel	wi-fi в лобби wi-fi на территории The reception	safe deposit boxes: for extra charge morning wake-up call business center	INCLUDED IN THE PRICE Accommodation, continental breakfast, use of infrastructure, use of the beach ENTERTAINMENT Entertainment and Sports	Wildlife Corner	Excursions	SPORT Additionally	darts table tennis Open areas	voleybolynaya badminton beach volleyball BEACH Beach own concrete-pebble length 150 m in 2016, was significantly renovated. Retaining wall was finished with bleached Siberian pine, which gave the beach a special charm and fascination. The beach area is divided into three terraces. Upper terrace - playground Summer bar "Triton". Average - concrete deck with a smooth descent to the sea, with swings, shady area and changing rooms. The lower terrace - concrete and pebble beach with shady areas, insipid shower, wooden walkways for the descent into the water, and deckchairs BEACH SERVICES Rent beach equipment (surcharge)	umbrellas awnings sunbeds BEACH DESCRIPTION Equipped	Playground: the beach at the general allocated a special area - children's beach with water attractions for children's activities showers cabanas awnings Beach towels restroom chairs: plastic; in a shady area - wood Distance from the beach: 50 m	pebble own CHILDREN Without a seat and supply accepts children up to 3 years The discount for accommodation with breakfast on the additional bed: children 3-6 years - 50%, 6-14 years - 30% FOR CHILDREN Facilities for children	playground mini-zoo: pavlinariy hire	high chair in the hall of supply: free cot, playpen: free of charge, on request Service	children's menu SPA Specialized programs with spa elements	"The attack on cellulite" "Slimming and Body Shaping" Massages	Facial Treatments	Hand care	Body care	figure modeling Park Hotel and boarding house "Sand Bay" . Distance from the town's bus station is about 7 km from the international airport of Simferopol - 100 km. The park with rare plants inhabit wild turtledove, squirrels, weasels and hedgehogs. Equipped with gazebo, rotunda, benches and walking paths leading to the beach. 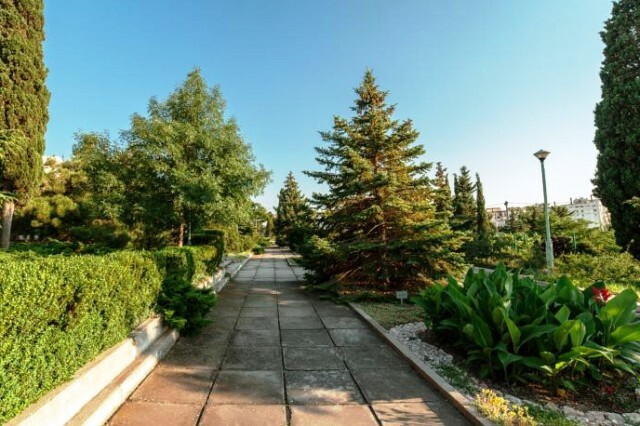 The private beach area at the Park Hotel is a significant advantage, because in Sevastopol are not many hotels have their own beaches Residential complex "Sand Bay" consists of two buildings: "Antey" - 150 meters from the sea and "Poseidon" - luxury housing in the 50 meters from the sea. Both buildings have independent heating, room hot and cold water, wi-fi, cable TV and work all year round. All rooms are decorated in a classic style and are equipped with refrigerator, air conditioning, flat-screen TV. Bathrooms come with a hairdryer. The rooms "Poseidon" housing also has bathrobes, slippers, umbrellas, safe and tea sets. Some rooms have a panoramic view on the sandy bay The on-site mud baths. It offers individual cosmetic treatments (massage, anti-aging mask) and complex treatment of diseases of the skin, musculoskeletal system, male reproductive organs, central nervous system, peripheral nervous system, gynecological diseases. Procedures occasion based on the unique therapeutic mud of Saki Lake. Guests on site: two cafes, a barbecue area with a gazebo, two professional beach volleyball, darts, badminton, boccia, mini-zoo with peacocks and pheasants For the youngest guests a children's playground on the beach and in the park, a special children's area bathing beach, a children's menu in the cafe. Some rooms can accommodate a cot free Guests of the Park Hotel provides free wi-fi. For business travelers and groups, the hotel has a fully equipped conference room and a set of business services (fax, copier, printer, scanning and printing of documents). You can also receive and hold conferences, seminars, sports and themed events. The Territory has a secured parking. From the hotel the nearest public transport station, market and shops provides a free shuttle (shuttle). Possible car rental Resort and recreation complex "Sand Bay" - a unique tourist object of Sevastopol, having reconstructed the number of rooms, its own beach-park area and Bole than half a century of history. 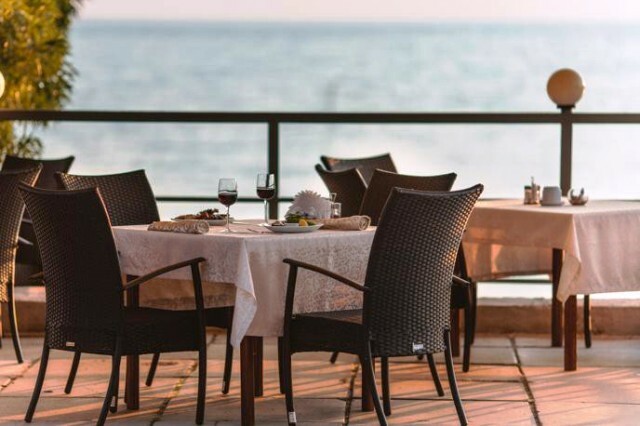 Within the complex you will find: two corps level comfort - "Antey" and business - "Poseidon", two areas with a unique white sand and two cafes, one of which is located in the beach area, from which you can enjoy an unforgettable sunset view in Sand Bay . For younger guests a playground. The beach area of ​​the complex is divided into three terraces. Upper terrace - playground Summer bar "Triton". Average - a platform with a smooth descent to the sea, with swings, shady area and changing rooms. The lower terrace - beach with shady areas, showers, paths for the descent into the water, and sun loungers. Sand Bay Hotel Location The complex is located next to the National Reserve "Chersonese" on the beautiful bay - Sand, 50 meters from the sea. You can take care of your health by taking the sea and sunbathing on the landscaped beach. 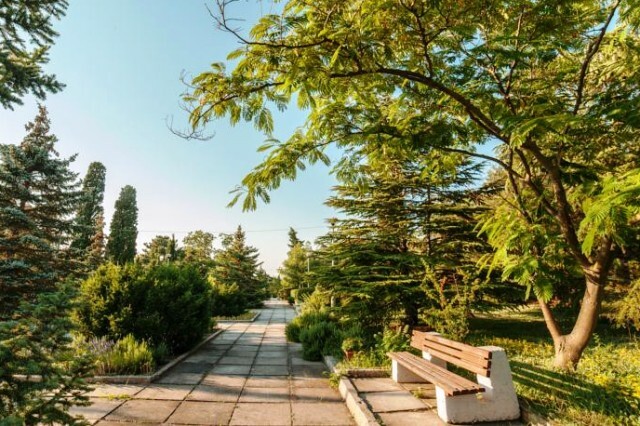 Enjoy the therapeutic microclimate in a park of 3.8 hectares, which is formed by a combination of sea air ions with volatile production of coniferous trees. 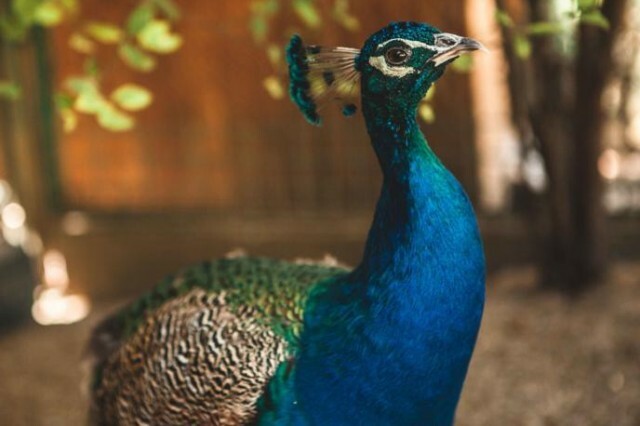 The park is home to pheasants, doves, squirrels, weasels and hedgehogs. Rooms at Sand Bay All rooms at the 'Sand Cove' decorated in a modern style, equipped with air conditioning, refrigerator, satellite TV and flat-screen TV. The bathrooms have a shower or bath. The rooms have views of the sea or the park. Single room housing "Comfort" The rooms have a view of the southern part of the park. Total area - 9 sq.m. Main place - 1, additional bed - 0. Superior Single Room Corps "Comfort" The rooms offer a sea view and the park complex. Total area - 12 sq.m. Main place - 1, additional bed - 0. Double body "Comfort" Double Room. Park view. Total area - 15 sq.m. In the room: 2 single beds, wardrobe, table, fridge, TV. Bathroom: shower, hair dryer, sink, toilet, complimentary toiletries. Superior Double body "Comfort" Double Room. Seaview. Total area - 24 sq.m. All rooms are designed as studios, with sofa bed in a recreation area. In the room: one double bed, wardrobe, table, fridge, TV. Bathroom: shower, hair dryer, sink, toilet, complimentary toiletries. Family Room Corps "Comfort" Triple two-room suite with a balcony. Seaview. Total area - 25 sq.m. Main place - 3, additional bed - 0. In a large room: 1 double bed, wardrobe, table, fridge, TV, balcony. In the second room: 1 single bed. Bathroom: shower, hair dryer, sink, toilet, complimentary toiletries. Single room housing "Elite" Single. Total area - 16 sq.m. Main place - 1, additional bed - 0. In the room: furniture - queen-size bed, a wardrobe with a built-in safe, desk console, chair, dresser for clothes, two bedside tables, hanger, mirror. 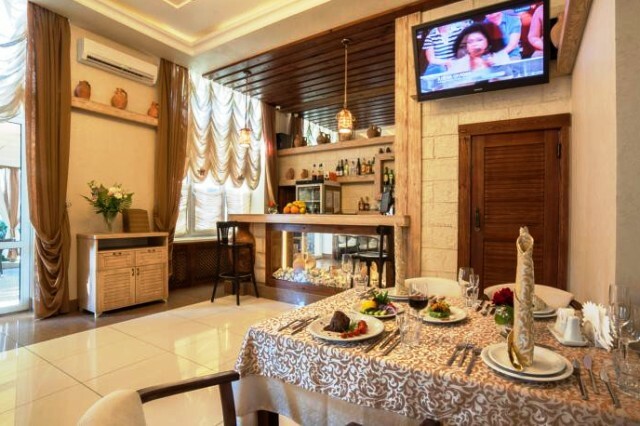 Equipment: TV (cable TV), refrigerator, internal telephone for communication with a reception and a café, electric kettle and tea utensils, split system, an electronic lock. Business Double Room Corps "Elite" Double Room. Total area - 18 sq.m. Main place - 2, additional bed - 0. All rooms have furniture - double bed or two single beds, a wardrobe with a built-in safe, desk console, chair, dresser for clothes, two bedside tables, hanger, mirror. Equipment: TV (cable TV), refrigerator, internal telephone for communication with a reception and a café, electric kettle and tea utensils, split system, an electronic lock. 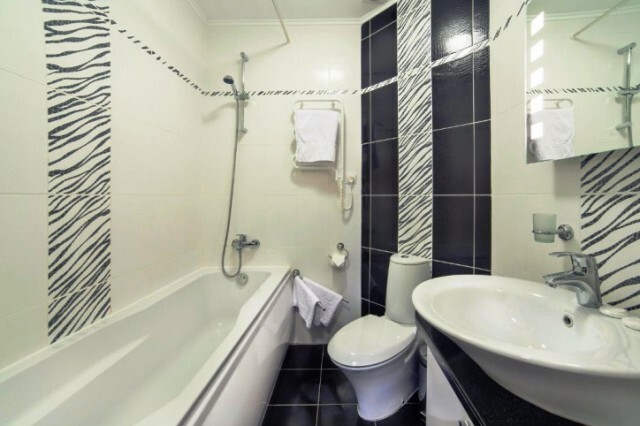 Bathroom: shower, sink, toilet, hairdryer, bathrobes, slippers, complimentary toiletries. Superior body "Elite" double room Total area - 20 sq.m. Main place - 2. All rooms have furniture - double bed or two single beds, a wardrobe with a built-in safe, desk console, chair, dresser for clothes, two bedside tables, hanger, mirror. Equipment: TV (cable TV), refrigerator, internal telephone for communication with a reception and a café, electric kettle and tea utensils, split system, an electronic lock. 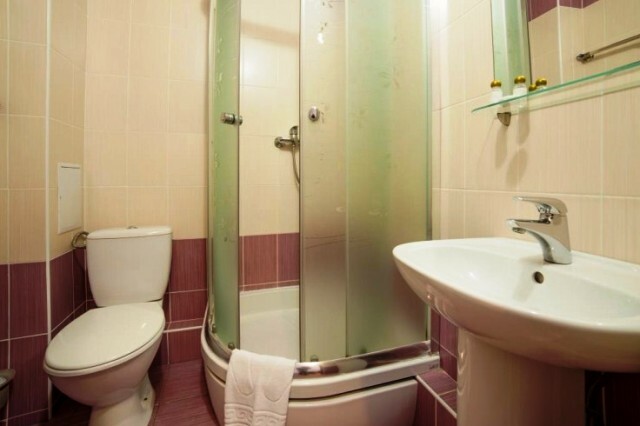 Bathroom: shower, sink, toilet, hairdryer, bathrobes, slippers, complimentary toiletries. Deluxe Double Room Corps "Elite" Double superior comfort. The total area - 25 sq.m. Main place - 2, additional bed - 1. All rooms have furniture - bed, wardrobe with built-in safe, desk console, chair, dresser for clothes, two bedside tables, hanger, mirror. Equipment: TV (cable TV), refrigerator, internal telephone for communication with a reception and a café, electric kettle and tea utensils, hair dryer, split system, an electronic lock. 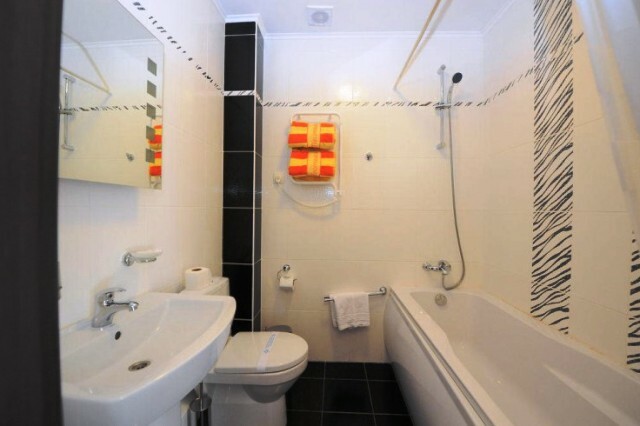 Bathroom: bath, sink, toilet, hairdryer, bathrobes, slippers, complimentary toiletries. Family Room Corps "Elite" Two family room. Total area - 25 sq.m. Main place - 4, extra bed - 1. First room: double bed, wardrobe with built-in safe, desk console, chair, dresser for clothes, bedside tables, sofa bed, hanger, mirror. The second room: 2 single beds, wardrobe, table. Rooms are not communicating. Equipment: TV (cable TV), refrigerator, internal telephone for communication with a reception and a café, electric kettle and tea utensils, split system, an electronic lock. Bathroom: bath, shower, hair dryer, sink, toilet, bathrobes, slippers, complimentary toiletries. Standard Apartment building "Elite" Two-room suite with a kitchen. Total area - 28 sq.m. Main place - 2, additional bed - 1. In the room: one double bed, sofa, TV, desk. Equipment: telephone, air-conditioner, TV, electronic lock. In the kitchen: built-in kitchen, hob, extractor hood, countertops, refrigerator, electric kettle and tea utensils, Room: wardrobe, safe, dining table, chairs. Bathroom: bath, sink, toilet, bathrobes, slippers, complimentary toiletries. Luxury housing "Elite" Double two-room suite overlooking the sea, with two balconies. Total area - 30 sq.m. Main place - 2, additional bed - 1. Features: stand for things, hanger, mirror. Equipment: refrigerator, telephone, hair dryer, air-conditioner, TV, electronic locking, electric kettle and tea utensils. Living room: sofa, table, wardrobe, French balcony. Beachfront Complex. Bedroom with one double bed, wardrobe, desk and a balcony. View of the beach, "Sandy." 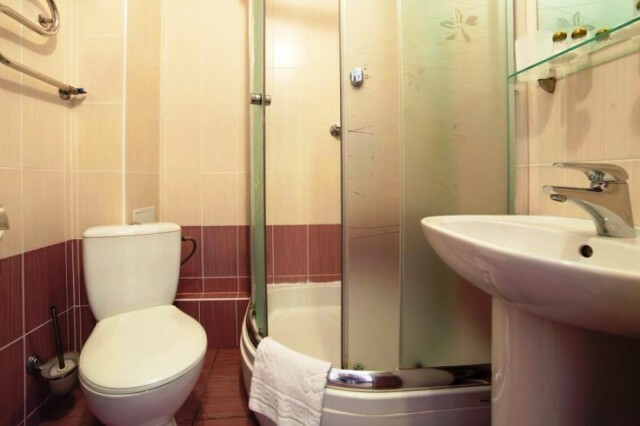 Bathroom: large bath, sink, toilet, bathrobes, slippers, complimentary toiletries. Restaurants, bars Power set menu is carried out in a cafe "Antey" and in the summer cafe "Triton". 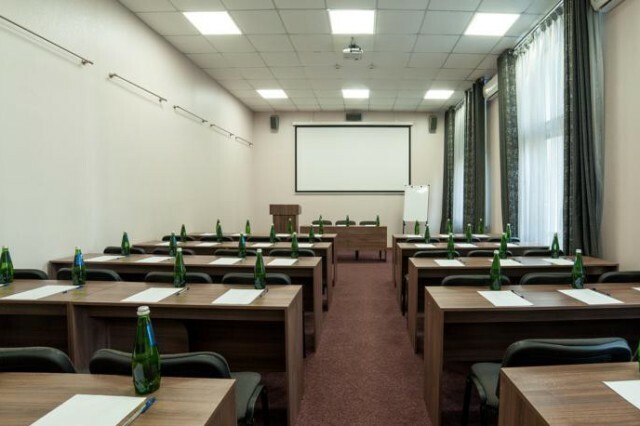 For business Due equipped conference room and business services set for business people offers a high quality level of service, including the organization of team building, sports events and a variety of excursions. The complex offers free, high-speed Wi-Fi. Hotel Facilities parking conference hall Wi-Fi In the room TV satellite or cable TV fridge central air conditioning For children playground on the beach and in the park Free bikes and scooters pavlinariy sport Beach volleyball table tennis Sand Bay Beach Hotel Beach front line. Distance from the sea - 50 m. Concrete and pebble beach length of 150 m, 50 m from the hull "Poseidon." 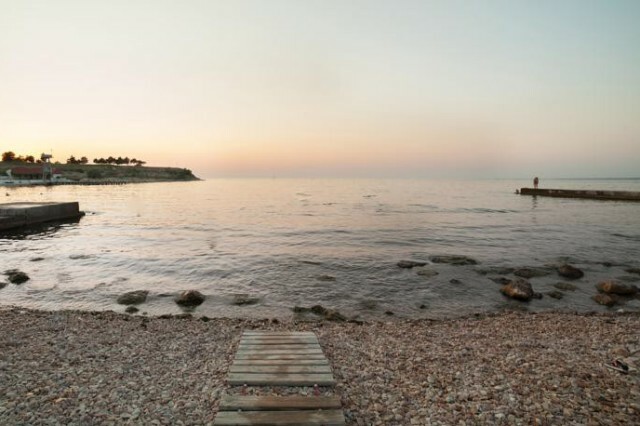 Hotel Sand Bay Sewastopol Russisch Resort und Erholungskomplex "Sand Bay" - ein einzigartiges touristisches Ziel von Sewastopol, nachdem die Anzahl der Zimmer rekonstruiert, einen eigenen Strand-Parkanlage und Bole als einem halben Jahrhundert der Geschichte. Innerhalb des Komplexes finden Sie: zwei Korps Ebene Komfort - "Antey" und Geschäft - "Poseidon", zwei Bereiche mit einem einzigartigen weißen Sand und zwei Cafés, von denen einer im Strandbereich befindet, von dem aus Sie einen unvergesslichen Blick auf den Sonnenuntergang in Sand Bay genießen können . Für die kleinen Gäste einen Spielplatz. Der Strandbereich des Komplexes ist in drei Terrassen aufgeteilt. Obere Terrasse - Spielplatz Sommer-Bar "Triton". Durchschnitt - eine Plattform mit einer glatten Abstieg zum Meer, mit Schaukeln, schattigen Bereich und Umkleideräume. Die untere Terrasse - Strand mit schattigen Bereichen, Duschen, Wege für den Abstieg ins Wasser, und Sonnenliegen. Sand Bay Hotel Lage Der Komplex befindet sich neben dem National Reserve "Chersones" an der schönen Bucht - Sand, nur 50 Meter vom Meer entfernt. Sie können Ihre Gesundheit kümmern durch das Meer zu nehmen und auf den gepflegten Strand sonnen. Genießen Sie den therapeutischen Mikroklima in einem Park von 3,8 Hektar, die durch eine Kombination von Meer Luftionen mit flüchtigen Produktion von Nadelbäumen gebildet wird. Der Park ist die Heimat von Fasanen, Tauben, Eichhörnchen, Wiesel und Igel. Die Zimmer im Sand Bay Alle Zimmer im 'Sand Cove "in einem modernen Stil eingerichtet, ausgestattet mit Klimaanlage, Kühlschrank, Sat-TV und Flachbild-TV. Die Badezimmer verfügen über eine Dusche oder Badewanne. Die Zimmer haben Blick auf das Meer oder den Park. Einzelzimmer Gehäuse "Comfort" Die Zimmer verfügen über einen Blick auf den südlichen Teil des Parks. Gesamtfläche - 9 qm Hauptort - 1, Ersatzbett - 0. Superior Einzelzimmer Corps "Comfort" Die Zimmer bieten einen Blick auf das Meer und den Park-Komplex. Gesamtfläche - 12 qm Hauptort - 1, Ersatzbett - 0. Doppel Körper "Comfort" Doppelzimmer. Blick auf den Park. Gesamtfläche - 15 qm Im Zimmer: 2 Einzelbetten, Schrank, Tisch, Kühlschrank, TV. Badezimmer: Dusche, Fön, Waschbecken, WC, kostenlose Toilettenartikel. Superior Doppel Körper "Comfort" Doppelzimmer. Seaview. Gesamtfläche - 24 qm Alle Zimmer sind als Studios entworfen, mit einem Schlafsofa im Erholungsgebiet. Im Zimmer: ein Doppelbett, Schrank, Tisch, Kühlschrank, TV. Badezimmer: Dusche, Fön, Waschbecken, WC, kostenlose Toilettenartikel. Familienzimmer Corps "Comfort" Triple-zwei-Zimmer-Suite mit Balkon. Seaview. Gesamtfläche - 25 qm Hauptort - 3, Zusatzbett - 0. In einem großen Raum: 1 Doppelbett, Schrank, Tisch, Kühlschrank, TV, Balkon. Im zweiten Zimmer: 1 Einzelbett. Badezimmer: Dusche, Fön, Waschbecken, WC, kostenlose Toilettenartikel. Einzelzimmer Gehäuse "Elite" Einzeln. Gesamtfläche - 16 qm Hauptort - 1, Ersatzbett - 0. Im Zimmer: Möbel - Queen-Size-Bett, einen Schrank mit einem eingebauten Safe, Schreibtisch-Konsole, ein Stuhl, eine Kommode für Kleidung, zwei Nachttische, Kleiderbügel, Spiegel. Ausstattung: TV (Kabel-TV), Kühlschrank, interne Telefon für die Kommunikation mit einem Empfang und einem Café, einem Wasserkocher und Tee Utensilien, Split-System, ein elektronisches Schloss. Business Doppelzimmer Corps "Elite" Doppelzimmer. Gesamtfläche - 18 qm Hauptort - 2, Zusatzbett - 0. Alle Zimmer verfügen über Möbel - Doppelbett oder zwei Einzelbetten, einen Schrank mit einem eingebauten Safe, Schreibtisch-Konsole, ein Stuhl, eine Kommode für Kleidung, zwei Nachttische, Kleiderbügel, Spiegel. Ausstattung: TV (Kabel-TV), Kühlschrank, interne Telefon für die Kommunikation mit einem Empfang und einem Café, einem Wasserkocher und Tee Utensilien, Split-System, ein elektronisches Schloss. Badezimmer: Dusche, Waschbecken, WC, Föhn, Bademantel, Hausschuhe, kostenlose Toilettenartikel. Superior-Körper "Elite" Doppelzimmer Gesamtfläche - 20 qm Hauptort - 2. Alle Zimmer verfügen über Möbel - Doppelbett oder zwei Einzelbetten, einen Schrank mit einem eingebauten Safe, Schreibtisch-Konsole, ein Stuhl, eine Kommode für Kleidung, zwei Nachttische, Kleiderbügel, Spiegel. Ausstattung: TV (Kabel-TV), Kühlschrank, interne Telefon für die Kommunikation mit einem Empfang und einem Café, einem Wasserkocher und Tee Utensilien, Split-System, ein elektronisches Schloss. Badezimmer: Dusche, Waschbecken, WC, Föhn, Bademantel, Hausschuhe, kostenlose Toilettenartikel. Deluxe Doppelzimmer Corps "Elite" Doppel höchsten Komfort. Die Gesamtfläche - 25 qm Hauptort - 2, Ersatzbett - 1. Alle Zimmer verfügen über Möbel - Bett, Schrank mit eingebautem Safe, Schreibtisch-Konsole, ein Stuhl, eine Kommode für Kleidung, zwei Nachttische, Kleiderbügel, Spiegel. Ausstattung: TV (Kabel-TV), Kühlschrank, interne Telefon für die Kommunikation mit einem Empfang und einem Café, einem Wasserkocher und Tee Utensilien, Haartrockner, Split-System, ein elektronisches Schloss. Badezimmer: Badewanne, Waschbecken, WC, Föhn, Bademantel, Hausschuhe, kostenlose Toilettenartikel. Familienzimmer Corps "Elite" Zwei Familienzimmer. Gesamtfläche - 25 qm Hauptort - 4, Extrabett - 1. Erste Zimmer: Doppelbett, Schrank mit eingebautem Safe, Schreibtisch-Konsole, ein Stuhl, eine Kommode für Kleidung, Nachttische, Schlafsofa, Aufhänger, Spiegel. Das zweite Zimmer: 2 Einzelbetten, Schrank, Tisch. Die Zimmer sind Kommunikation nicht. Ausstattung: TV (Kabel-TV), Kühlschrank, interne Telefon für die Kommunikation mit einem Empfang und einem Café, einem Wasserkocher und Tee Utensilien, Split-System, ein elektronisches Schloss. Badezimmer: Badewanne, Dusche, Haartrockner, Waschbecken, WC, Bademantel, Hausschuhe, kostenlose Toilettenartikel. Standard Apartment Gebäude "Elite" Zwei-Zimmer-Suite mit einer Küche. Gesamtfläche - 28 qm Hauptort - 2, Ersatzbett - 1. Im Zimmer: ein Doppelbett, Sofa, Fernseher, Schreibtisch. Ausstattung: Telefon, Klimaanlage, TV, elektronische Sperre. In der Küche: Einbauküche, Herd, Dunstabzugshaube, Arbeitsplatten, Kühlschrank, Wasserkocher und Tee Utensilien, Raum: Kleiderschrank, Safe, Esstisch, Stühle. 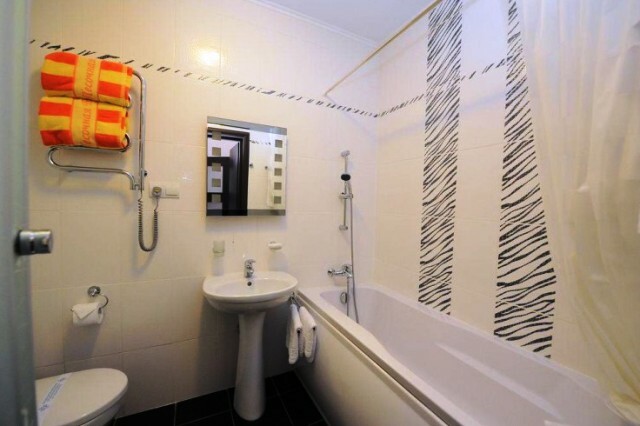 Badezimmer: Badewanne, Waschbecken, WC, Bademantel, Hausschuhe, kostenlose Toilettenartikel. Luxus-Gehäuse "Elite" Doppel Zwei-Zimmer-Suite mit Blick auf das Meer, mit zwei Balkonen. Gesamtfläche - 30 qm Hauptort - 2, Ersatzbett - 1. Features: stehen für Dinge, Kleiderbügel, Spiegel. Ausstattung: Kühlschrank, Telefon, Föhn, Klimaanlage, TV, elektronische Verriegelung, Wasserkocher und Tee Utensilien. Wohnzimmer: Sofa, Tisch, Schrank, Französisch Balkon. Beachfront Complex. Schlafzimmer mit einem Doppelbett, einen Kleiderschrank, einen Schreibtisch und einen Balkon. Blick auf den Strand, "Sandy". Badezimmer: große Badewanne, Waschbecken, WC, Bademantel, Hausschuhe, kostenlose Toilettenartikel. Restaurants, Bars Power-Set-Menü wird in einem Café "Antey" und im Sommer-Café "Triton" durchgeführt. 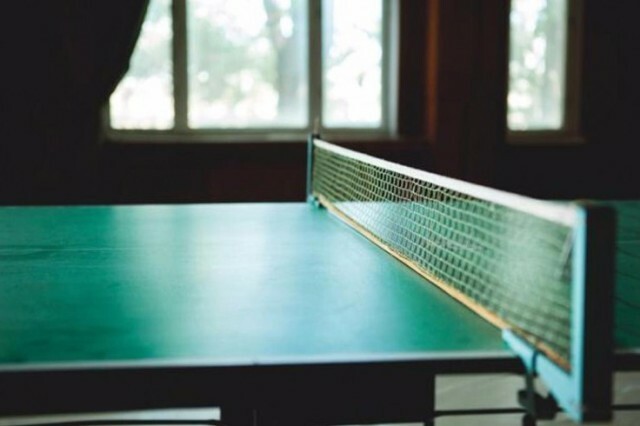 Für Unternehmen Aufgrund ausgestatteter Konferenzraum und Serviceleistungen für Geschäftsleute setzen für Geschäftsleute bietet ein hohes Qualitätsniveau an Service, einschließlich der Organisation von Teambuilding, Sportveranstaltungen und eine Vielzahl von Exkursionen. Der Komplex bietet einen kostenlosen Highspeed-WLAN. Hotelausstattung Parkplatz Sitzungssaal Wi-Fi Eigenschaften Fernseher Satellit oder Kabel-TV Kühlschrank zentrale Klimaanlage für Kinder Spielplatz am Strand und im Park Kostenlose Fahrräder und Roller pavlinariy Sport Beachvolleyball Tischtennis Sand Bay Beach Hotel Direkt am Strand. Die Entfernung vom Meer -. ". Poseidon" 50 m Beton und Kieselstrand von 150 m Länge, 50 m vom Rumpf Die Zimmer in diesem Hotel ist 1 350 Rubel. 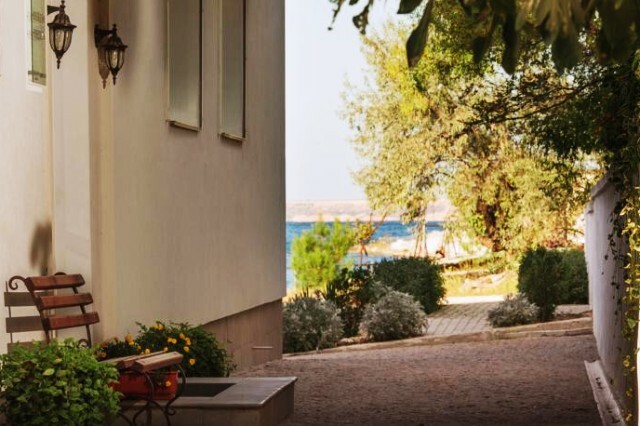 pro Nacht Sand on the shore of the bay and close to the National Reserve "Chersonese" located hotel "Sand Bay", which is ready to offer guests an unforgettable stay in a comfortable environment . 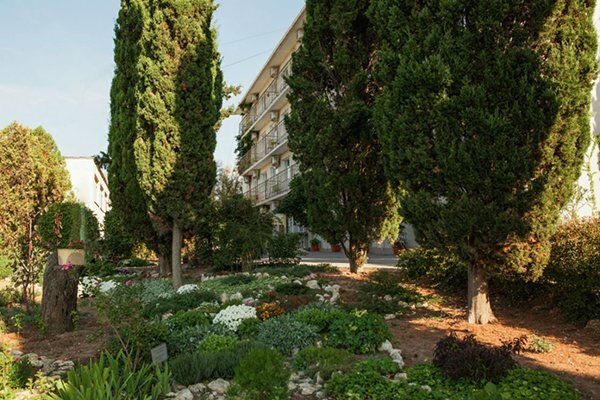 Hotel consists of 3 buildings - Antaeus, Poseidon, Flora. 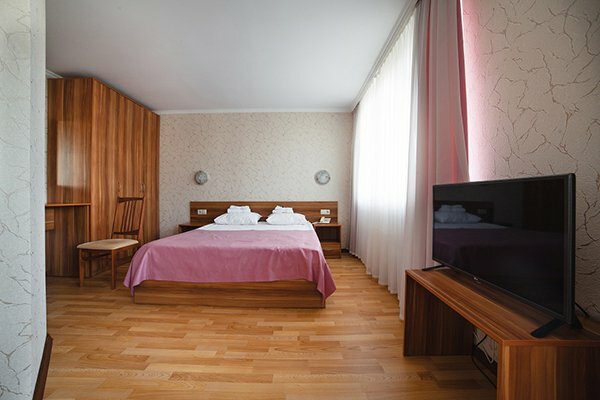 All rooms have the necessary furniture and appliances, to every guest feel comfortable conditions. 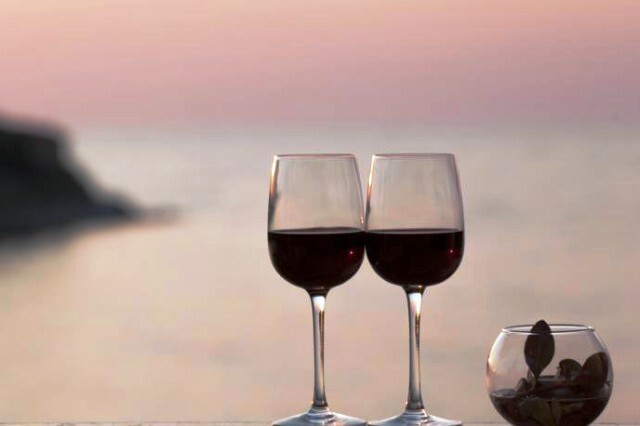 On site "Sandy Bay" is a bar and a café where guests can eat, relax and unwind in comfortable surroundings. Business people will benefit from the conference room, which is equipped with everything necessary for meetings, trainings and seminars. There is also a cinema room is available and a dance hall. Highly qualified and friendly staff will not leave any guest without his attention. Staying in a hotel "Sand Bay" Cigarettes leave only the most pleasant memories in my heart a rest.